This region shares its name with the body of water called the Vilhon Reach, a long southern arm of the Sea of Fallen Stars. The region encompasses much of the southern shore of the Sea of Fallen Stars, from the mouth of the Reach west and north to the mouth of the Wet River, and south to the Golden Plains. It is a fertile, rich land divided up into quarreling city-states and petty nations. For all its unrest, the Vilhon remains vital to the whole of Faerûn: It forms the trade link between the Lake of Steam, the Shaar, and the rest of the world through its ports on the Sea of Fallen Stars. With the subtropical and humid weather of the Vilhon Reach, winter temperatures rarely reach the freezing point, snowfalls are rare, and heavy winter rains are common. Spring arrives early, and summer comes hard on its heels with scorching temperatures and oppressive humidity. Autumn brings cooler weather and lower humidity, but an autumn day in the Vilhon can be as warm as high summer in more northerly regions. The three important nations of the Reach are Chondath, Sespech, and Turmish. In addition, a large number of independent city-states and minor local authorities occupy the region. Most sages recognize the Vilhon Reach as the cradle from which waves of humans spread forth to conquer and inhabit Faerûn. Something of this adventuresome spirit is still present in the Reach: many of the locals leave their homeland to seek their fortunes as mercenaries. The folk of the Vilhon Reach tend to welcome visitors as bearers of news or potential trading partners. Spellcasters are well advised to keep a low profile in the Reach, where mages have a reputation for capricious use of power. The folk of the Reach have no patience for displays of flashy magic, nor any tolerance for those who use their spells carelessly. For such a civilized and sophisticated populace, the folk of the Vilhon Reach show a remarkable respect for nature. This is partly due to the history of the area, which is marked by plagues and volcanic eruptions, and partially due to the influence of the Emerald Enclave. This druidic organization, founded in 374 DR and headquartered on the island of Ilighôn at the mouth of the Vilhon Reach, strives to hold human civilized development to a pace that nature can endure. The Vilhon Reach itself is the dominant feature in the region, along with the surrounding islands and mountains. This deep arm of the Sea of Fallen Stars extends southwest from the Eyes of Silvanus to the Deepwing and Cloven Mountains. Its two major tributaries are the Nagaflow and Nun rivers. Cloven Mountains: These mountains rise from the southern shore of the Deepwash. They earned their name from the broad gap where the Wintercloak River flows out of the Deepwash. Several tribes of goblinoids inhabit the wild and desolate range, but they spend most of their time fighting each other. A great catlike beast stalks the Cloven's peaks and highest valleys, preying on unwary goblinoids and the occasional hunter foolish enough to come seeking it. Deepwash: This freshwater lake is the largest in the Vilhon. Tributaries from the Cloven and Deepwing mountains fill it with dear, cold water. The Wintercloak River is its main outlet. The lake teems with fish and also harbors a massive dragon turtle that lairs near Surkh. Eyes of Silvanus: This pair of islands guards the entry to the Vilhon Reach. The western island, Ilighôn, is home to the Emerald Enclave organization. The eastern island, Wavecrest, is an uninhabited jungle teeming with wild animals and monsters. The islands play havoc with ship's compasses, forcing navigation by lead line and by eye. This magnetic anomaly appears to be entirely natural. Dangerous reefs surround both islands. The only safe passage between the islands is at the Strait of Silvanus, which passes between Ixinos and Wavecrest to the east and Ilighôn to the west. Shining Plains: This vast, dry grassland gets its name from the shimmering heat waves that rise from it most of the year. It holds the human cities of Assam, Lheshayl, and Ormath. It is also home to many tribes of centaurs and wemics, of which the Tenpaw wemic tribe is the best known. The territory's total population is roughly 423,000 inhabitants. Wetwoods: This extensive bog is often sheathed in mist and occasionally hosts bandits who harass the trade routes leading north from Assam. The mist also hides small villages of lizardfolk, halflings, and other humanoids, none of which wish to become involved in the affairs of the Vilhon. These cities are presently independent, though that status is subject to change. Assam (Small City, 6,513): Assam is the northernmost city on the Shining Plains, yet still several leagues south of the plains' northern edge. It lies on the south bank of the Wet River, where the road from Ormath crosses over a wide ford. It is an open city in more ways than one: Assam has no walls, and it is ruled jointly by the city-states of Lheshayl and Ormath. Assam is a merchant's town, dedicated to trade. Caravans, wagons, and herds of animals encircle the city like a waiting army. Delegates from Lheshayl and Ormath make up the ruling council. The current mayor is Honlinar Tempest (LN male human Ftr7), a master politician who keeps things running smoothly. Honlinar serves at the pleasure of Lheshayl and Ormath, and he keeps his masters happy by dealing swiftly with any business interruptions. Hlondeth (Metropolis, 45,360; total territory population 453,600): An independent walled city-state that commands the main road (the Holondar) west out of Turmish, Hiondeth also serves as a port conveniently located directly across from Arrabar, Chondath's capital. Hlondeth is a stunning, ancient metropolis whose architecture is dominated by serpent designs and shiny green marble brought out of the Orsraun Mountains. This beautiful stone is the city's most famous product, sold both carved into statues and in uncut blocks. Hlondeth has been known as the City of Serpents since 527 DR. The city had been all but overrun by kobolds from the Orsraun Mountains. After a tenday, the defenders of Hlondeth faltered, and all seemed lost until a noble of the city, Shevron Extaminos, emerged from his walled residence at the head of a vast mass of snakes. Shevron's counterattack broke the siege and sent the kobolds fleeing. Shevron was killed in the fighting and given a hero's burial. The Extaminos family has ruled Hlondeth ever since. Even mixing yuan-ti blood into the line did not shake the family's power. Hlondeth is currently ruled by a yuan-ti half-blood, Dediana Extaminos (LE female halfblood yuan-ti Sor10). Dediana has a snake's tail and no legs. Dediana apparently rules with a light hand, for the city remains profitable and has good relationships with both Chondath and Turmish, though Hlondeth jealously guards its independence. Lheshayl (Small City, 7,165): This westernmost city of the Shining Plains produces more and finer horses than Ormath and Assam put together. Lheshayl is ruled by Chief Entawanata (CN male human Ftr5), the latest of a long line of chiefs. Nimpeth (Large City, 12,377; total territory population 27,700): Nimpeth is best known for its wine (its vineyards are among the best in Faerûn), its mercenaries, and its slave trade. River traffic coming down the Nagaflow stops at Nimpeth before venturing out into the Sea of Fallen Stars or moving on to other cities of the Vilhon. Ormath (Small City, 6,513): Of the three cities of the Shining Plains, Ormath is the one most likely to go to war over the slightest insult. The city keeps pace with the traffic on the Pikemen's Folly (the road leading west from Hlondeth) and controls the junction between the Pikemen's Folly and the road leading north. Ormath shares control of Assam with Lheshayl, and it would like nothing better than to have sole control. However, it is unlikely that the shayl would tolerate such a move. The current ruler of Ormath is Lord Quwen (LN male human Ftr11), a mountain of a man and a true warrior at heart. He frequently leads patrols outside the city, keeping the roads clear of bandits. Lord Quwen has become concerned about reports of hostile lizardfolk in the Wetwoods. Sapra (Large Town, 3,226): Located on the isle of Ilighôn, Sapra has become a haven for beings who seek refuge from wizards. The druids of the Emerald Enclave granted the city a fixed amount of land and will not allow it to expand even an inch, so conditions are crowded. A part-time council of six elders rules the city, meeting twice a month or as needed. The current head of the council is Mayor Thomas Flagcairn (NG male human Exp4), the town blacksmith. Surkh (Small City, 9,770): All the citizens of this city on the north shore of the Deepwash are lizardfolk. The lizardfolk keep to themselves, though they have cordial relations with the Emerald Enclave, Nimpeth, and Lheshayl. They fish in the Deepwash and rarely venture into the nearby human territories. Nothing threatens them in their isolation, except for an ancient dragon turtle living in the depths of the lake. Many here regard death in the creature's jaws as an honor, though not one they actively seek. The earliest recorded settlement in the Vilhon was the city of Alaghôn, now the capital of Turmish. By -37 DR, Alaghôn was a thriving port. The success of Alaghôn marked the rise of trade and wealth throughout the Vilhon, which gave rise to a collection of warring city-states, each striving to command as much trade and territory as possible. Waves of settlers from the Vilhon founded the modern nation of Sembia and reclaimed the Vast after the fall of the dwarven kingdom there. Trade rivalries and expansionism within rhe Vilhon also brought about numerous wars as the powerful states of Chondath and Turmish struggled against each other and against the smaller city-states that popped up around them. Shifting alliances and internecine conflicts kept the two giants locked in a stalemate. Independent cities of the Vilhon fell under the control of Turmish or Chondath, but they often managed to break free with time. The Vilhon has suffered numerous outbreaks of plague through the centuries, thanks to its warm climate, active trade, and crowded cities. Misused magic has started plagues as well. The first great plague swept the region in 75 DR, the Year of the Clinging Death. Half the human population of the Vilhon died as the disease ravaged the cities. An even more infamous plague struck in 902 DR, when the then-powerful nation of Chondath was in its fifth year of civil war. Wizards in the cities of Arrabar and Rlath, seeking to end the war, loosed ancient necromantic magic that slew two-thirds of the population of the Nun River valley and sent a wave of panic throughout the Vilhon. The Rotting War reinforced a loathing for wizards throughout the Vilhon and gave rise to the independence of Sespech, until then part of Chondath. The Vilhon today is a land of commerce and intrigue. The independent city-states keep a wary eye on their larger, more powerful neighbors; the large countries keep a wary eye on each other; and everyone keeps a wary eye on the elves and on the Emerald Enclave. To look on Chondath now, a scattering of allied city-states and towns strung along the southern shore of the Sea of Fallen Stars, it's hard to believe this is the same nation that produced the merchants who settled the powerhouse country of Sembia. Most other cities in the Vilhon were once part of its empire or suffered under its cruel armies. Now, Chondath is a land darkened by its fall from glory, by the grasping ambitions of its rulers, and by foes all around it. Trade keeps a constant flow of folk leaving and arriving in Chondath from afar, and leads to more tolerance of varying ways and outlanders than visitors expect. Chondathans are generally slender, tawny-skinned folk with brown hair ranging from almost blond to almost black. Chondathans have green or brown eyes. Elves and half-elves are tolerated but not loved, and nonhumans in general are a quiet minority here. Most Chondathans spend their lives engaged in intrigue, covert manipulation, and trade with distant lands (or at least investments in trade conducted by others). Chondathans strive to perfectly control their voices, faces, and mannerisms to reflect only those emotions they desire to display. Chondathans distrust wizards and the bold use of magic. Folk in Chondath assume that Arrabar still holds deadly plague-hurling magic for a future lunatic to unleash. Chondathans are warlike, indulging in hunting games from an early age. They dress in a wide variety of fashions drawn from all over Faerûn, though leather armor and head coverings are common, thanks to the warm, damp climate. Chondath includes territory stretching from the Nunwood in the northeast to the Nagaflow River in the west, and south to the River Arran, though its political control over the whole area is in doubt. Chondalwood: The Chondalwood is a large expanse of forest south of Chondath. It is a rarity in that its borders continue to expand, particularly to the north. Satyrs and centaurs roam this land, as well as various plant creatures such as shambling mounds and tendriculoses. Mistletoe and other parasitic plants are common, as are all sorts of mushrooms and other fungi. The druids who live within the heart of the Chondalwood are savage, angry dervishes, as willing to attack paladins as orcs in their protection of the woodlands. A sizable nation of elves also calls the Chondalwood home. These wild elves never joined the Retreat and they remain hidden in the depths of the wood today, ready to repel human encroachment. The secretive ghostwise halflings live here as well, a barbaric folk of nomadic clans deep within the forest. Chondath's cities are its main points of interest today. Arrabar (Metropolis, 61,012): Arrabar is a sprawling and ancient city, the capital of a shrunken empire. Despite its age, the metropolis is clean and well maintained. Its people are fisherfolk, merchants, craftsfolk, and mercenaries. Among the latter group are members of mercenary companies who rest here between assignments, and members of private armies permanently stationed in the capital. Arrabar marks the western end of the so called Emerald Corridor, the road that runs the length of Chondath, terminating at Ulath. The Golden Road from the south also ends here. 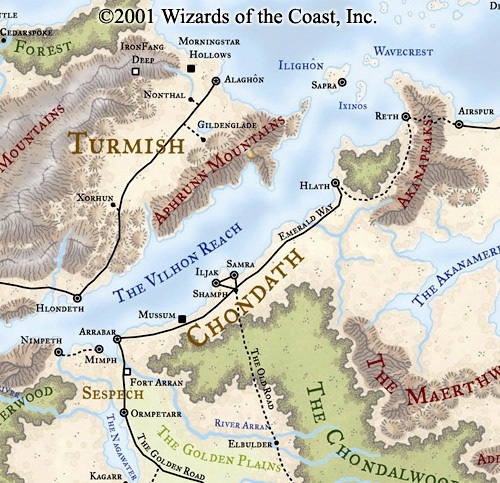 The two roads and Arrabar's location on the Vilhon Reach make it a center for trade and help keep Chondath's coffers full. The most resplendent edifice in the city is the Generon, the ruling palace of the Lord of Arrabar and all Chondath, Eles Wianar (NE male human Wiz13/Acm1). It is a stately dome glittering in gold and silver, ringed by barracks and strong points for Wianar's personal army. Along the outer walls of the city lie various noble houses, each with its own private army. Arrabar holds enough military might to wreak havoc anywhere. Though commoners in Arrabar are as wary of wizards as anyone in the Vilhon, Eles Wianar is not, and he has granted the Red Wizards an enclave. Hlath (Large City) 23,969): Lord Darvis Shennelm (CN male human Ftr14) rules this busy port. Its chief export is lumber cut from the nearby Nunwood, an activity the Emerald Enclave monitors carefully. Hlath is locked in a minor trade war with Iljak over the flow of goods coming up the Old Road. Mercenaries and adventurers can always find work here guarding caravans (or attacking them). Iljak (Large City, 17,432): This centrally located port was burned to the ground thirty years ago, the victim of a vicious trade war. The city, with its newly completed walls, has no intention of being caught unprepared a second time. Iljak's chief industries are fishing and agriculture. Its fields produce a variety of grains that eventually make their way all across Chondath. The rule of Governor Anton Yinoran (NE male human Ftrl3) is fairly tolerable by Chondathan standards. Many believe him to be a puppet of Arrabar, a charge he denies. Reth (Metropolis, 63,191): Reth is located at the far north end of Chondath's coast. It gained its independence from Chondath during the Rotting War and deals with that country as little as possible today. Once famous as a training center for gladiators, Reth still holds gladiatorial combats twice a tenday in its great arena. Most of the gladiators are freeborn adventurers seeking fame and wealth, and many of them find it. Reth's main industries are fishing, quarrying, and logging. The latter has caused some strain between Reth and the Emerald Enclave, and the city is slowly abandoning the lumber industry. Its main source of timber, the Nunwood, lies a fair distance away, and the trade is not profitable enough to risk the wrath of the druids. Reth is ruled by a freely elected mayor who sees to the concerns of the city's citizens. The real power lies in the hands of the Seven Senators, autocrats who each tend to a particular aspect of the government. Meanwhile, the Zhentarim have started making overtures to the city officials, trying to gain a foothold for power in Chessenta both politically and through the Banite Temple of Dark Eyes here. Shamph (Metropolis, 32,687): Known as the Crossroads City because of its location at the junction of the Emerald Way and the Old Road leading south, Shamph is a thriving city that benefits hugely from the war between Iljak and Hlath. Merchants coming from the south hurriedly sell their goods in Shamph rather than enter the war zone. Merchants in Shamph then sell those goods to the highest bidder. Mayor Tian Redown (LN male human Rog11) has no intention of letting the situation end anytime soon, and does all he can to make sure the war continues. Along the Vilhon Reach, the population repeatedly outstrips even prodigious local crop yields. As a result, the Vilhon has been the source of many wars, and the cradle of mercenaries and merchants who seek their fortunes elsewhere. 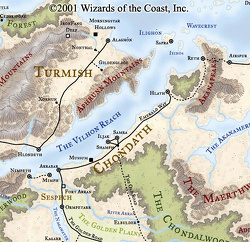 Chondath was created in 144 DR by the spreading influence of the rich city of Arrabar, whose lords built the Emerald Way trade road to Shamph and eventually to Hlath. This road allowed Arrabar to gather lands and cities under its sway. Five hundred years ago, Chondath was one of the mightiest trading empires, expanding into what is now Sembia. Chondath's greatness was shattered on the battlefield. First came a short war wherein Chondath was defeated with contemptuous ease by the elves of Cormanthor, then forced to abandon its northern holdings and their rich lumber. Hard on the heels of this strife came the infamous Rotting War, a struggle between the rich coastal cities of Arrabar, Hlath, and Reth. The war ended at the Battle of the Fields of Nun in 902 DR with the slaughter of Chondath's best warriors and the release of a magical plague. The country was reduced to widely separated and independent cities, wary to this day of plague-bearing outsiders and strong magic of all sorts. Chondath is now a coastal verge of city-states that turn their backs on the wild country near the monster-haunted Chondalwood. The coast east of the River Nun is a lawless land where mercenaries skirmish endlessly, and wolves and leucrottas roam untended farms and devour unburied dead. The Shining Lord of Arrabar nominally rules all the land between the rivers Arran and Nun, but the cities of Orbrech and Timindar and forty-odd smaller settlements lie in ruins or are held by independent adventurer-lords. These minor lords eke out a hard living by hunting, raiding, and trading, and they spit on decrees sent out from "Shining Arrabar." Eles Wianar longs to restore Chondath to its former glory, and many of his countryfolk feel the same way, even if they have no love for Wianar. A cold and calculating man with his own personal network of spies all over the Vilhon Reach, Wianar does nothing to stop the intrigues his nobles launch against each other, and he even lets them wage war outside Arrabar as they please (and can afford). He knows such pursuits keep the nobles busy fighting each other and serve to cloak his own acts against the lands and independent cities around Chondath. In Chondath's current state of decline, strong adventurers could easily make a name for themselves by clearing territory and claiming land as their own. External Combustion: In the Chondalwood, explorers find ancient, toppled stone towers whose cellars are packed with gold coins. The treasure is guarded by strange, ravaging magic that makes wizards go mad and causes others to burst into flame and burn like torches. Eles Wianar has called for adventurers willing to face a little danger o report to him in Arrabar. Some Chondathans say the treasure rumor is false, and that the lord is recruiting formidable adventurers for another purpose. Others say the ruins hold a powerful magic-using monster of some sort, or even an adventuring band that the lord wants dealt with, but no treasure at all. Whatever the truth of the matter, adventurers are arriving in Arrabar, and Wianar is reaching quiet deals with them before they slip away. Sespech is a barony located at the southwest end of the Vilhon Reach. Once a part of Chondath, Sespech maintains its independence through naval power and diplomacy. Baron Aldorn Thuragar (LN male human Ftrl2), sometimes known as the Foesmasher, rules Sespech. Once a bold adventurer, Thuragar relies on several old comrades from his adventuring company, the Band of Iron, to help him govern the country. The people of Sespech are tall and olive-skinned like the Chondathans to the east. Some keep their beards short, but most men shave regularly. The warriors of Sespech are skilled riders, and their cavalry is second only to the riders of Lheshayl. Due to the constant danger from Chondath; all young men of Sespech enter military service for at least six years and can be recalled at any time. Sespech needs all the soldiers it can impress into service. Magic is more deeply suspect in Sespech than it is elsewhere in the Vilhon Reach. Anyone using magic to harm another can expect a quick execution. Open rule has always been important in Sespech. Twice each month, the cities of Sespech hold communal gatherings to discuss recent political developments and other matters of public concern. A minister from the court of Baron Thuragar attends every gathering. In rare cases, Thuragar himself attends. Sespech extends from the River Arran in the east to the Nagaflow in the west, and south to the Golden Plains. Golden Plains: Named for their tall golden grasses, these fertile lands blanket the whole area between the Nagaflow and Arran rivers. Nagawater: A large number of water nagas live in the southern end of this deep lake. By old agreement, the nagas stick to the south half the lake, and humans remain in the north. A line of floating and submerged buoys bearing continual flame spells marks the boundary. Many nagas born in the lake make their way up the Nagaflow to lair in the depths of the Chondalwood. Sespech lies between two great forests - the Chondalwood and the Winterwood - and two great rivers, the Arran and the Nagaflow. Its folk live along the northern shores of the Nagawater. Elbulder (Large City, 12,701): The Old Road leading north from Torsch provides a steady stream of travelers and trade to Elbolder. Venturesome souls who follow the road through the Chondalwood find the city a welcome place of rest, though its citizens are seldom impressed by tales of encounters with wild elves or sylvan monsters. The current mayor of Elbulder is Gavilon Jostins (NG male human Wiz16), a retired adventurer who came to rule the city when Baron Foesmasher took over Sespech. Soon after Gavilon took control of Elbulder, Chondathan troops attacked with orders to capture the city. Gavilon drove off the soldiers with fireball and lightning-bolt spells, and the citizens of Elbulder admitted that wizards could be handy to have around. Fort Arran: This outpost guards the road south into the heart of Sespech and keeps a constant watch of Chondath. If a war is to be fought, Fort Arran may well be the site of the first battle. The garrison at the fort is charged with delaying the Chondathans until messengers can be sent to Mimph, Elbulder, and Ormpetarr. Serving at Fort Arran is considered a great honor. General Marcius Stonehall (LG male dwarf Ftr11) leads the garrison of one thousand soldiers. Marcius served with Baron Thuragar and Lord-Mayor Gavilon of Elbulder during their adventuring days, but none of the trio discusses those adventures in public. Mimph (Metropolis, 27,519): Mimph is only miles by sea from Arrabar, and no love is lost between the two cities. Traders normally conduct business exclusively in one city or the other. Ships from Arrabar board vessels bound for Mimph from time to time and confiscate their cargoes. This piracy led Baron Thuragar to create his navy, with Mimph as a base. Though no road connects Mimph to the rest of Sespech, the city receives a reasonable amount of overland trade, especially from merchants who distrust Chondath. Caravans leave the Old Road at Ormpetarr and either travel cross-country or transfer their cargoes to boats that sail over the Nagawater and out into the Reach. The current overlord of Mimph is Admiral Kalisa Tauno (NG female moon half-elf Rgrl4 of Lurue), one of the few high officials in Sespech who is not one of Thuragar's old adventuring companions. The high priest of the city's newest church is Marasa Ferrentio (LN female human Clr16 of Helm), once the Band of Iron's cleric. Ormpetarr (Metropolis, 77,037): The capital of Sespech houses Baron Thuragar Foesmasher himself, along with the bulk of the country's military. It is an ancient, walled metropolis on the east shore of the Nagawater whose major industries are trade, horse raising, fishing, and agriculture. Ormpetarr handles all the trade moving along the Golden Road from Innarlith, and it serves as a banking center as well. The city is far from peaceful. Bandits raid the city's caravans, the baron endures assassination attempts, and the city thieves' guild forces bloody confrontation in the shops and streets. The current head of the thieves' guild, Haskar Corintis (LE male human Rogl7/Asn2/Gld2), is behind the trouble. He despises the baron for bringing law and order back to the city. Chondath finances Haskar's activities, but the guildmaster would be the baron's foe even if he wasn't receiving pay from a foreign power. The rulers of Chondath sent settlers into what was to become Sespech around 170 DR to secure a source of horses for its cavalry. Burgeoning trade from the south helped the new settlements grow rapidly, and Sespech prospered alongside Chondath for decades. Sespech declared its independence from Chondath during the Rotting War, and since that time it has been held by a number of rebels, occupying forces, and adventurers. Baron Thuragar came to power after a mysterious series of assassinations convinced the last baron to seek safety closer to the Lord of Chondath's court in Arrabar. Thuragar has given the people stability by removing opportunists from high posts and replacing them with trusted friends. Sespech currently enjoys moderate taxes and firm, fair justice. Thuragar has used his popularity to institute a program of conscription that insures an adequate force for self-defense. The soldiers of Sespech, conscripts and professionals alike, wear purple feathers in their helms to signify their loyalty. The baron is engaged in a shipbuilding program. He forged a trade alliance with merchants from Hlondeth, but Thuragar's overtures to Hlondeth may be working too well The ambassador from Hlondeth is Dmetiro Extaminos, son of the evil ruler of that city. Dmetiro is courting the baron's daughter, Glisena. Neither Thuragar nor Glisena desires the match, but Sespech cannot afford to offend Hlondeth. Spies from the other powers of the Vilhon's villainous merchant princes, and monsters from the dangerous forests nearby infest Sespech. Baron for a Day: A calm, self-assured official approaches the PCs with an offer to make one of them "Baron for a Day." The character is offered a brief job magically impersonating the baron. The character might be asked to pay a visit to Elbulder, inspect the fleet in Mimph, or preside at a celebration in Ormpetarr. A double might be needed for any number of reasons. Perhaps the baron is about to embark on some secret negotiations, or perhaps he needs to throw a pack of assassins off the scent. The character's companions can go along disguised as guards or members of the baronial party. The assignment is dangerous, but the pay is good (700-1,000 gp per character): If attacked, the characters are to slay their assailants if necessary, but capture them if possible. Live captives bring an additional bonus. Turmish lies in the northwest of the Vilhon Reach. It is a rich, fertile, farming land of villages and few cities - peaceful, civilized, and well managed. Turmish features rolling fields divided by hedges or dense rows of trees, with ample room for wild creatures. The mountains to the west harbor orcs, kobolds, and other monsters, but few raid Turmish thanks to well-organized mercenary bands that serve as local militias. Turmish's natives have an excellent reputation as fair traders, welcome throughout the Inner Sea. The area is remarkably popular with adventurers despite its lack of monsters. Buried treasure abounds (at least according to bards' tales), and the area offers plenty of ruins and wild lands to explore. The people of Turmish are tall, mahogany-skinned, and comely. The men of the trading class wear long beards with the ends carefully squared off. The phrase "square as a Turmian beard" signifies any thing well or carefully done. In addition to its farms, Turmish is known for its ornate and finely crafted armor. This armor is embellished with embossing, spires, and raised, fluted curves, mixing elven and human styles. It is sometimes hard to know which is more important to a Turmian fighter, his armor or his beard. The Turmians have a variety of customs, both quaint and bizarre. Among the best known is the tradition of the guest dish. Anyone visiting a Turmian home, even on business, is expected to present a fine dish of food. Snails in an ornate bowl made from a skull are a perennial favorite. The Orsraun Mountains form Turmish's western border. The Aphrunn Mountains lie to the south and the Sea of Fallen Stars to the north. Mountains of the Alnoreum: These northernmost peaks of the Orsraun Mountains nestle against the Gulthmere Forest. Treefall Pass separates them from the rest of the Orsraun. The range includes Mount Andrus, a semiactive volcano sacred to worshipers of Talos, who are rumored to be in league with an evil being or community dwelling in the heart of the volcano. The Alaoreum also holds Ironfang Deep, a great dwarven delving that produces high-quality iron ore, gems, and gold. Ironfang Deep supplies most of Turmish's iron. Aphrunn Mountains: These mountains have long served as a shield of stone between Turmish and the towns and city-states than have sprung up on the shores of the Reach. Travelers are familiar with Mount Kolimnis, also called Eversmoke for its volcanic activity. Over a decade ago, the mountain threatened to destroy the city of Gildenglade, but the eruption subsided before inflicting any damage. Orsraun Mountains: The largest tallest mountain range south of the Spine of the World is a well-known abode for all sorts of evil creatures, including kobolds, orcs, goblinoids, and red dragons. It is a wild place, untouched by the civilized lands of Turmish. Turmish is dotted with hundreds of agricultural communities too small to appear on most maps, all interconnected with winding country lanes so tangled that they would drive an invader mad. Its few large cities are the jewels of the country. Alaghôn (Metropolis, 88,704): Nearly the entire capital of Turmish is built of stone. A great fire in 352 DR razed the city, and laws have since required that all new construction must be stone or brick. Older buildings have been expanded and remodeled numerous times, and have several layers of old walls behind facades. This construction has created thousands of cubbyholes and hiding places in the city. Games of hide-and-seek are popular among Alaghôn's children. A freely elected council governs Turmish's ancient capital. Each citizen, regardless of race and social position, has a single vote. The chief speaker is chosen from the ranks of this Free Council. The duties of this chief speaker are few, the most dramatic being to maintain local and mercenary units for defense from pirates and other nations. The rest of the country is organized along similar lines. Gildenglade (Metropolis, 48,384): This city is the second largest in Turmish, home to dwarves, elves, and half-elves. Its economy is based on woodcutting, woodworking, and mining. The elves rule the community and handle all negotiations with the Emerald Enclave. The elves are skilled enough in forestry and preservation that they probably have the best rapport with the Enclave of any city in the Reach. The dwarf population concentrates on mining the unusually pure veins of gold that honeycomb the earth below Gildenglade. Nonthal (Large City, 12,902) The smell of manure mixed with the odor of slaughterhouses and tanneries provides an unforgettable olfactory experience for visitors to this town. Still, the lure of gold draws the curious to its streets and inns. Nonthal was named for a wizard who set up shop here over a century ago. He built a cottage behind a local inn, erected signs warning people to leave him alone, then disappeared. His house was ransacked after his presumed death, and directions were found to a place called Nonthal's Hold, a ruin said to hold a portal or series of portals to distant locales. The origins of Turmish go back to the founding of Alaghôn in -37 DR. Alaghôn eventually became the capital of a powerful confederation of warlike, mercantile city-states similar to Chondath in its heyday. In 142 DR, the Lord of Alaghôn, Dempster Turmish, expanded his control to include all the territory Turmish encompasses today. Dempster Turmish's efforts to expand his borders to include the city-state of Hlondeth and beyond never quite came to fruition, and by the time of his death in 150 DR, Hlondeth remained free. After Dempster's death, Turmish had no strong leader for over a century. Political control ebbed back and forth between the various nobles and merchant houses. Turmish's commercial power remained undimmed during this period, however, because the Turmians never let their political ambitions get in the way of business. By 1242 DR, control of Turmish passed into the claws of the blue dragon Anaglathos, who insinuated himself into the capital and staged a coup. The dragon ruled as a despot for five years, nearly driving the country into ruin. The paladin Corwin Freas slew Anaglathos and liberated Turmish in 1247 DR. Uncomfortable with ruling, Corwin abdicated the following year after creating the republic that rules Turmish today. Corwin was assassinated in a coup attempt in 1254 DR, but the coup failed and the republic stood. Turmish remains peaceful but wary today. Its ships patrol the Vilhon Reath, keeping trade routes open, and its mercenary militia keeps the country's borders secure. Turmish worries about Chondath's rising power, but it has not offered Sespech assistance for fear of provoking Chondath. Like elsewhere in the Vilhon Reach, mercenary companies and adventuring bands perform jobs normally associated with a local militia. They are hired out to scout and patrol the "wild areas" of Turmish. Vanishing Fans: Folk in Turmish are flocking to see the half-elf known as the Songbird, a singer and actor of extraordinary beauty, grace, and talent. She's performing a new cycle of ballads about the mythical Princess Arissaea, a favorite subject of songs in the Inner Sea for some centuries, who grows from sheltered innocent, to slave, to pirate, to dragon slayer. She eventually liberates her conquered homeland, ascends its throne, and finds love and happiness. With each performance, members of the Songbird's audience disappear. No common theme (wealth, gender, trade, or place of residence) is discerned among the missing, but since the group includes several heirs to family wealth or trading companies, concern is growing. Adventurers are being hired both to locate the missing persons and to capture whoever has conducted the abductions. The Songbird herself was questioned, but she pleads ignorance of any wrongdoing. Divination spells do not seem to work on the Songbird.